Review: I'm a ball of emotions right now and I don't know what to do with any of it except for the fact I know I need the next book in my hands like yesterday. I am happy to announce The Empress did not in any way suffer the second book syndrome, nope none at all. S.J. Kincaid made sure of that as she ripped my heart in two and damn near gave me a heart attack a few times. The book picks up a while after the last one ended. Tyrus is now emperor and Nemesis is the new empress to be. Of course, if you read The Diabolic you know many will have issues with a diabolic being their new empress and if you remember the chaos and betrayals and back-stabbing from the first book oh you can bet your last dollar this book does not fall short, in actuality, there was much more scheming and what the f*** moments in The Empress then there ever was in The Diabolic, and The Diabolic had plenty. Funny thing is The Diabolic was originally a standalone and I was happy with that, I loved how it ended and when I saw The Empress was released and it was the second book in the series I was on the fence of whether I was going to pick it up, honestly I was leaning more towards not, because I was satisfied with The Diabolic and how it was wrapped up and I was afraid that this was just a money grab by the publishers so I was going to stay away, well the book gods had other plans evidently because The Empress showed up at my doorstep and I took it as a sign that I am meant to read it and so I did and I loved the hell out of it and I can't believe I almost passed up on this. Shame on me. 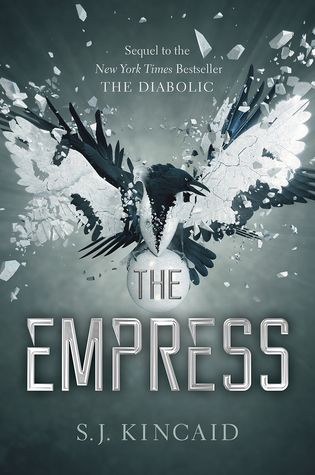 So if you are like me and you read the first book but not sure about The Empress, just go now and grab yourself a copy it was pretty effin' epic. Although reader beware the ending will kill you and wanting more. Luckily there is another book which now I will desperately be waiting for, with nervous anticipation.